Use our color palette generator to generate color schemes for parties or weddings. Choose from our selection of pre-made color schemes. You can also adjust our pre-made color schemes to create your own custom color scheme. 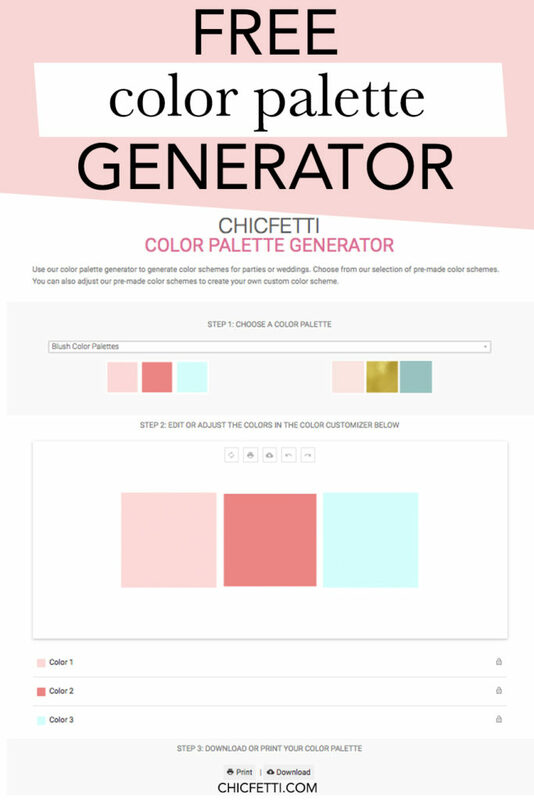 Use Chicfetti’s color palette generator to create custom party color palettes and wedding color palettes. Choose from the many pre-made color palettes that we have to offer or create your own custom color palette by changing the colors in the color palette editor. Once you are done making your color palette, you can either print your palette or download the palette as a .jpg, .png or a .pdf file. Choose from pre-made color palette combinations that look great together. We have even incorporated some metallics into our palettes including gold color palettes and rose gold color palettes. Our color scheme generator will help you create the perfect color scheme for your event.